"Assessing the value of a journal beyond the impact factor"
The well-documented limitations of journal impact factor rankings and perceptual ratings, the evolving scholarly communication system, the open-access movement, and increasing globalization are some reasons that prompted an examination of journal value rather than just impact. Using a single, specialized journal established in 1960, about education for the Information professions, the author discusses the fall from citation grace of the Journal of Education for Library and Information Science (JELIS) in terms of impact factor and declining subscriptions. Journal evaluation studies in Library and Information Science based on subjective ratings are used to show the high rank of JELIS during the same period (1984–2004) and explain why impact factors and perceptual ratings either singly or jointly are inadequate measures for understanding the value of specialized, scholarly journals such as JELIS. This case study was also a search for bibliometric measures of journal value. 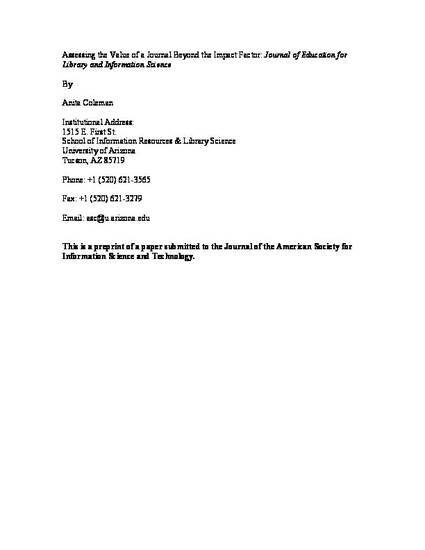 Three measures, namely journal attraction power, author associativity, and journal consumption power, were selected; two of them were redefined as journal measures of affinity (the proportion of foreign authors), associativity (the amount of collaboration), and calculated as objective indicators of journal value. The affinity and associativity for JELIS calculated for 1984, 1994, 2004, and consumption calculated for 1985 and 1994 show a holding pattern; however, they also reveal interesting dimensions for future study. Journal value is multidimensional and citations do not capture all the facets; costs, benefits, and measures for informative and scientific value must be distinguished and developed in a fuller model of journal value.